My last blog ended with the riddle of what is missing from this Celebrity Solstice that is on other Celebrity ships, but that it would be a welcome loss. The answer? Thresholds, sills, lips... whatever you want to call those elevated spots between public areas that for some manual wheelchair users amount to mini mountains and for someone using a walker they are like a car going through a parking lot with speed bumps. The only lip which we personally encountered was going from the Solstice Theatre toward the Galleria Boutiques. The Solstice Theatre offers excellent accessible seating so be sure to see their incredible new show called "Solstice." Guests will find truly accessible restrooms and well ramped access from outer decks with automatic doors along with additional access surprises in public areas... mostly positive ones. 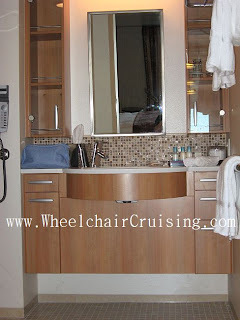 Along with Celebrity's newer standard access features, we were pleased to finally see a ship cabin with an added electrical outlet and we had the best drainage I've ever experienced in a roll-in shower. There were a few cabin negatives. Some of the accessible balconies reportedly have a longer ramp while ours was short and fairly steep. However, the sill in the balcony doorway was horrible. To Celebrity's credit they were attentive to our concerns and quick to address the situation. Before one of our clients went on the first official ("inaugural") sailing of Celebrity Solstice only six days later, the ship's crew came up with a fix. Though not the best accessible balcony sills among the fleet's ships, our client was able to easily and safely access his balcony with his manual wheelchair. I've been told that the sills were fixed in all of the accessible cabins. A second issue is a vanity panel across the front of the "roll-under sink." For some people, there is still enough depth but it would be more practical and accessible if that panel is removed and the pipes wrapped which will probably give another few inches in depth. Another fix needed is the threshold from the cabin to the corridor. The metal strip is at a right angle rather than beveled. Manual wheelchairs will need to "pop over" them. I believe these last two fixes are possible and can be accomplished with relative ease and expense. I'll be happy to report in a future blog once we have confirmation that these issues have been fixed. We have access photos of Celebrity Solstice on site's Celebrity Cruises photo gallery and will be adding more. When booking your Solstice cruise through us, your Access Travel Team specialist will share our "insider info & tips" with you.